The GPA Speed Air Evolution is an update to the very popular Speed’Air helmet. The new helmet features a new look with superior "Soft touch" finish giving the helmet a richer, softer coloring with new convex airflow wire vents. The inside shell was also improved for a better comfort and security, again lined with the removable washable lining. Another change comes in the mouldable pad in the neck harness with triple adjustment. 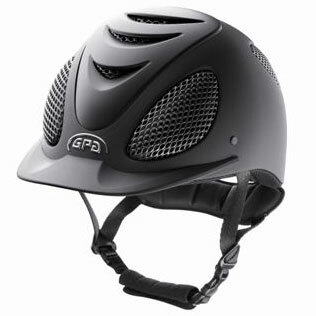 The riding helmet also includes a new GPA logo on the front. The ongoing research of helmet designs, safety tests, cutting-edge technology and quality materials are earning the GPA helmets the name of one of the safest helmets on the market. Helmet Sizing Guide - Please measure head at widest part (with hair up, if that is how helmet will be worn). Make sure the tape is snug. Please measure in centimeters for the best fit.